The first challenge of garage storage is that, unlike most rooms, this one's not exactly furnished. The good news is that the catchall furnishings you'll need for garage storage don't have to be expensive or even attractive - just functional. Here are some storage systems that you might want to consider for your garage, depending on what you store inside it. You will probably need a combination of one or more to meet all your needs. 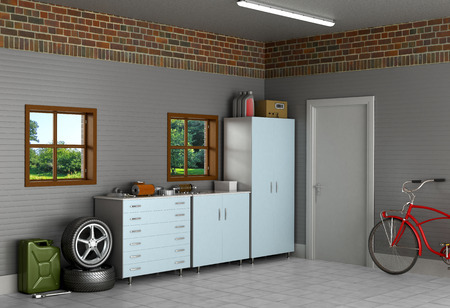 These garage storage systems are roughly arranged from most to least expensive. This is one of the most attractive garage storage systems available. It's also one of the most expensive. 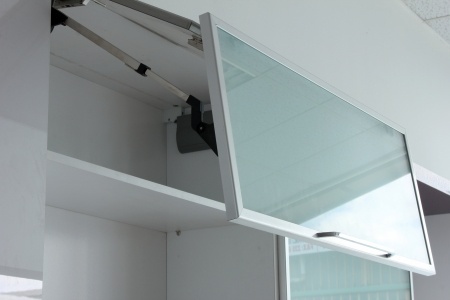 The advantages of floor-to-ceiling storage is that all your unsightly items are out of sight. And you can keep them relatively dust-free and clean. For neatniks, this might be a good choice. The bad news is that floor-to-ceiling cabinets are not deep or large enough to store big boxes or bulky items such as luggage. And small items can get lost within big cabinets unless you put boxes on the shelves to contain them. Friends of mine, a retired couple, Pat and Sam, use this room as a workspace for their hobbies. Sam likes to mount and frame artwork and prints. Pat likes to refinish old furniture. Neither hobby is an indoor activity. So Pat and Sam keep their equipment and supplies along opposite walls of the garage. When they're ready to work, they just back the car out of the garage into the driveway, pull their tools up front and center, and get down to business. For the long-term storage items you use only once in a blue moon, you might want to invest in lofts. These are platforms suspended about 4 or 5 feet from the ceiling. They are great for storing mementos, old financial records and paperwork, and other stuff you don't need but can't bear to part with right now. It keeps them dry and out of harm's way. You can put things you might need more often, such as luggage and pet carriers up on the loft, but store them at the front where they're pretty accessible. Instead of building them from wood, you can buy wire lofts that are about 4-by-4-feet that hang from the ceiling. If you don't want to actually create a loft, you may be able to store large items such as rafts or tents in the rafters. You can even devise a pulley system to pull them up and down. The sky - or the roof, anyway - is the limit. For just about anything you want to hang or store, there is a specialized rack designed specifically for it. There are racks to store balls, bikes, tennis supplies, you name it. Industrial storage shelves are the aluminum shelves you can get at hardware and home stores. They are inexpensive and light, and can hold everything from pantry items to sodas to boxes. Capacity on these shelves range from 50 pounds to more than 200 - so make sure you know how much weight yours can hold. This will be helpful when you're considering what to store where, but it's essential that you know if the kids try to climb them. For safety and a lot of other practical reasons, make all your storage units no-play zones. And if the kids don't comply, make the room and its contents off-limits for a day or two. Steel pegboards are those boards filled with holes on which you hang things on special hooks. Pegboards are very handy for storage because everything is accessible and in plain view yet not on the floor. They're great for storing bikes, gardening tools, work tools, and sports equipment. Remember that the garage is a really dirty place. And not everything can safely stored here. (Read more about garage storage no nos here.) Protect anything that's not sealed by storing it in plastic containers. (Another good reason to clean out junk here.) Wheeled containers are also great for toy pickup at the end of the day.